The TaylorMade RocketBallz iron set is engineered to promote more distance, improved accuracy and great feel. The Two-Piece metalwood-inspired construction in 3, 4, and 5 irons for low CG and high COR. The ultra-thin face flexes freely to promote COR up to the USGA limit for high ball speed. 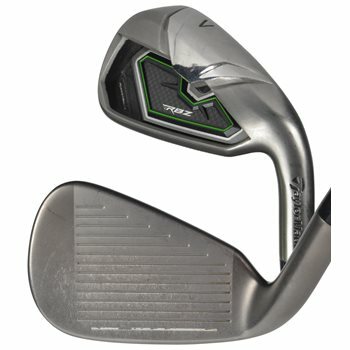 RocketBallz irons have a re-engineered face with a new "Toe-Bar" which controls face-flexion to direct shot straighter. The new vibration and sound control system promotes excellent feel and sound. Wedges incorporate new ATV sole for maximum versatility and playability. Is this a full set, or just irons ? It is a set of irons and the configuration is listed on each listing of what clubs the set includes.